Automating tests is an essential goal of any QA Engineer. It saves precious human resources and allows to maintain a healthy continuous integration. Unit and integration tests are closest to the developer’s work: libraries, classes and functions. However, when a project is GUI-intensive or use software with poor introspection/accessibility capabilities, visual tests are very helpful. In this regard, we at Canonical are developing some good QA tools and one of them is Xpresser. So, what is Xpresser? It’s a Python framework to do visual tests. It was originally developed by Gustavo Niemeyer. Xpresser’s main feature is to find saved images in the desktop. For example, if we want to check whether the Messaging Menu is active, we first save the blue icon and then command Xpresser to find it: Xpresser checks the whole visible desktop, as a regular person would do with its eyes. Xpresser is not only able to find images, but also to click on them. So in the previous case, will could open the Messaging Menu when active to then check whether Thunderbird is open. Xpresser even allows to simulate the keyboard. To illustrate this, watch this useful screencast done by Chris Wayne, who works with us at Canonical as QA Engineer in OEM. Xpresser is currently available in this PPA ppa:xpresser-team/ppa for Ubuntu Precise and Oneiric. 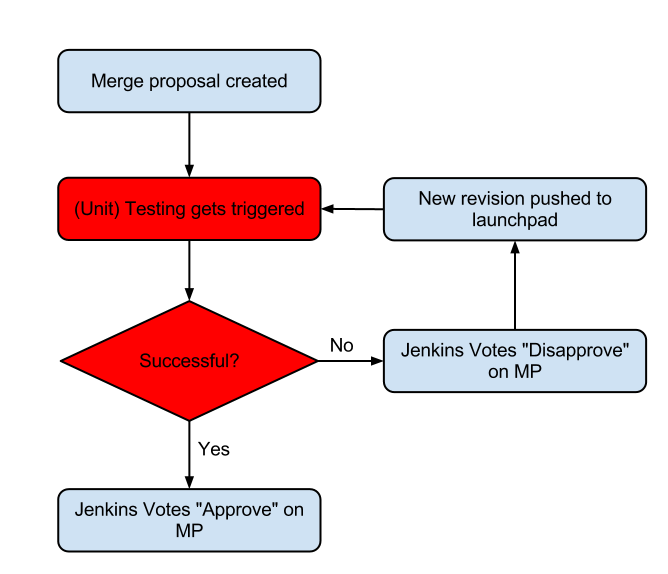 This post will describe how we are using Jenkins and Launchpad together to achieve Continuous integration. Right now we are running our tests right after the code is (manually) reviewed and just before pushing them to trunk. We refer to this part of the process as autolanding and there are tools (tarmac) which can automate the process. However the manual process of code review can take quite some and our jenkins jobs are not triggered until the review is ready. In our case we are using libvirt and VMs to achieve a clean and isolated test environment. Therefore we are doing some post-test clean-up actions (reverting the VM to a predefined snapshot). Our jenkins setup looks roughly like this. generic_update-mp – parametrized job which will take test result, merge proposal and few other parameters and updates the merge proposal in launchpad with the result. Right now we have a prototype in Python using a ScriptTrigger plugin for jenkins which is implementing all of this. I will describe in the next post how use it in practice together with some examples. Previously, Gerry Boland wrote eloquently about the testing solution in place for the Unity2D project. When writing something as complicated as a desktop shell, there is a need for functional testing as well as low-level unit testing. For the 2D team, this role is filled by testability. In the 3D team, we have autopilot: Autopilot aims to make writing functional tests for Unity as easy as possible. Previously, features that were too hard to test with unit tests were written as a “manual test”. Manual tests are text documents stored in the Unity source tree. When we prepare a point release of Unity we iterate through all the manual tests and ensure they all pass. This is obviously less than ideal – running the entire suite of manual tests takes a lot of time, and stops a developer from writing more code. Most of these tests can be automated. #. Quickly type 'edit<Enter>' - so you'd run 'gedit'. command is run (in this case gcc), this test failed. Type “g”, and wait for the command lens to refresh and show us some results. Quickly type “edit” and hit “Enter”. Wait (with a timeout) for the gedit application to launch. If gedit was launched, the test passed. If the timeout was reached, the test failed. On lines 9, 11, and 12 we’re generating X11 keyboard events (we can handle mouse events as well). This allows us to manipulate the various parts of the desktop shell just like a user would. On lines 8 and 14 we’re querying various parts of the unity shell for information. When we reveal the command lens we check that it’s actually showing by asking Unity internal state information. When we check for running applications we’re talking with the Bamf daemon. We generate the X events using python-xlib and the xtest extension. Of course, we don’t want programmers to have to deal with Xlib themselves, so we wrap all Xlib calls into two classes: “Keyboard” and “Mouse”. They work exactly as you’d expect. Implement the “GetName” and “AddProperties” methods. Even from this small part of the tree you can tell a lot about the state of my desktop shell: I have only one launcher (on monitor 0). Launcher keyboard navigation (as initiated by pressing Alt+F1 or Super+Tab) is not active, I have at least three launcher icons (actually many more, but they’re cut out of the image), including D-feet, gnome-terminal and the Quassel IRC client. All this information (and more) is available to autopilot tests. The combination of a vast amount of information, and the fact that Python is incredibly fast to work in makes it trivially easy to write autopilot tests. This is one of the key ways in which we’re testing unity for the precise release cycle. Currently we have around 100 tests, and many of these are parameterized to expand in certain conditions. For example, if the test machine has multiple monitors configured, almost all the launcher tests are configured to run once on each monitor. We use a similar technique to ensure that we support multiple international languages in the dash. The entire autopilot test suite runs on jenkins as well. We’ve recently started recording failing autopilot tests, which helps us diagnose failing tests. This is especially important, as the test machine may have different hardware or software configuration from a developer’s machine: being able to see the test failing makes diagnosing errors a lot easier. We’re always happy to have people writing autopilot tests. If you know a bit of Python, and are willing to learn about testing Unity, please find me (“thomi”) in the #ubuntu-unity channel on irc.freenode.net – I’m happy to guide anyone who would like to get involved through writing, testing, and submitting your first autopilot test. Testing is hugely important to us at Canonical. We all strive to have Ubuntu reliable, consistent and fast. But we’re human, and we make mistakes. Sometimes a bugfix will break something else, and for something as complex as a desktop shell, it’s easy to miss these breakages. While manual tests can help reduce these regressions, realistically we need an automated system to emulate the users inputs and verify our software works as it should – and scream bloody murder if it doesn’t! Testability is for Qt-based applications only! A limitation: yes, but this requirement comes with a great reward: Testability allows inspection of the tree of QObjects in a Qt application while it is running! It can read and write object properties, call methods and slots, verify signals are emitted, as well as fake mouse/keyboard/gesture inputs, grab visual outputs, and measure performance. 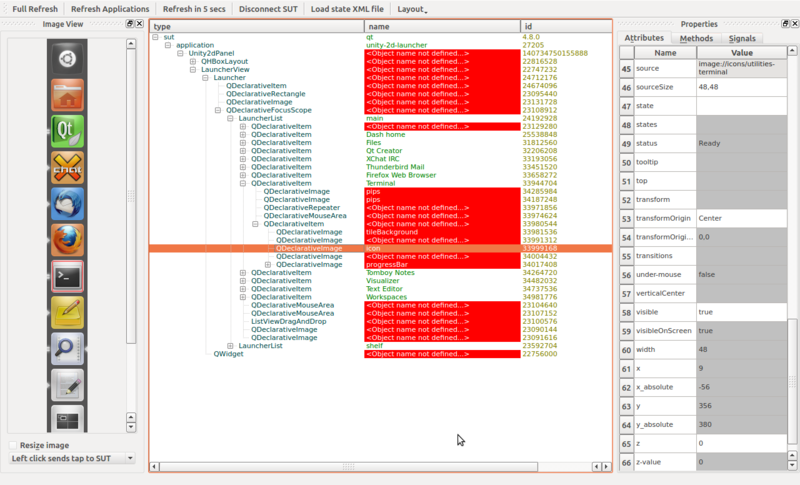 On the left is an interactive snapshot of the UI, in the centre is the QObject tree which you can navigate, and on the right is the list of the selected QObject’s properties, methods and signals you can interact with. On display in that screengrab are some of the attributes of the QDeclarativeImage object which draws the Terminal icon in the launcher (this is defined in QML!) – you can read off the source of the image, the x,y coordinates, width & height, and a whole lot more. All these properties, methods, signals, etc, are scriptable via Ruby. Thus we can emulate every interaction that a user can make with the application, and determine the reaction matches our expectation. This forms the foundation for the Unity 2D User Experience testing suite. any Qt application using Qt4.6+ can be tested by executing it with the “-testability” switch. a standalone server “qttasserver” runs in the background. 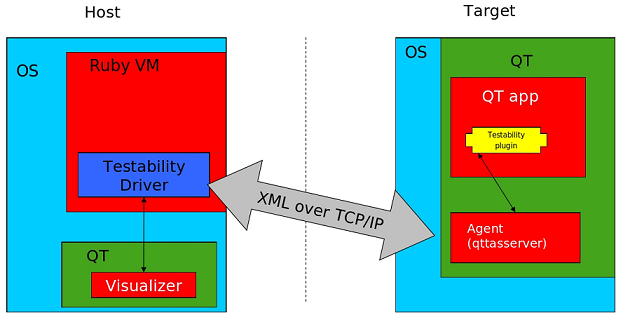 With the -testability switch, the Qt library tries to load a “libtestability.so” plugin which establishes a connection between the application and qttasserver, giving qttasserver access to the root node of the QObject tree. qttasserver then climbs the QObject tree, reads all the info it can and converts it to an XML format. It also can receive commands and cause the application to react upon them (click here, type, etc..). A series of Ruby scripts connect to qttasserver, receive and parse this XML and allow us to script tests and interactions with the application. Note that there is a clear divide between the machine of the target and of the host. This means Testability is great for testing software on embedded devices too. (Indeed Meego has been using it for that exact task!). It also reduces the risk that packages used to run the test suite could interfere with the software being tested. However there’s nothing stopping you having the target and host the same machine. themselves, we can test almost every behaviour of the desktop shell. And as a result, the quality of the user’s experience will only go up. Unfortunately Testability is not available in Ubuntu’s repositories just yet, but I have it packaged in a PPA. Installation takes a few steps, so I suggest that interested people consult this wiki page. Tests are just Ruby scripts, so running tests is just a matter of running a Ruby script! # Example test for Unity 2D with Testability Driver. # this is a bad test, as the name "Terminal" can be # localised, meaning a fail if you're using a non-English # installation. Choosing good objectNames is important! # This closes (kills actually) the launcher when we're done. This causes Testability to search for an object of type “LauncherView()” in the QObject tree, and if found reads its “width” property and returns it. Then in Ruby, we can check this value matches what we expect (65). The second test does a similar operation, but needs a little more help. As there are many tiles, we need to help Testability to find the exact tile we want. We do this by adding some object names (“main”, “Terminal”) to the C++/QML. By consulting with the Visualizer image above, maybe you can see how Testability navigates the tree to find the icon source for the Terminal tile! Once you can track down objects uniquely, you can then start interacting with them, send mouse clicks, set properties, call methods, etc. This power gives you great flexibility in testing your application! As a demo, here is a video of a part of the Unity 2D test suite in action. On the right is Ubuntu Oneiric running inside VirtualBox, where the Launcher will be tested. On the left is my host machine terminal running the test suite. Various hide/show tests are being performed, with windows in the way, mouse being controlled, keyboard shortcuts being pressed etc. Our policy is that every new feature and bug fix in Unity 2D will now be tested like this. You can see our growing test suite here. 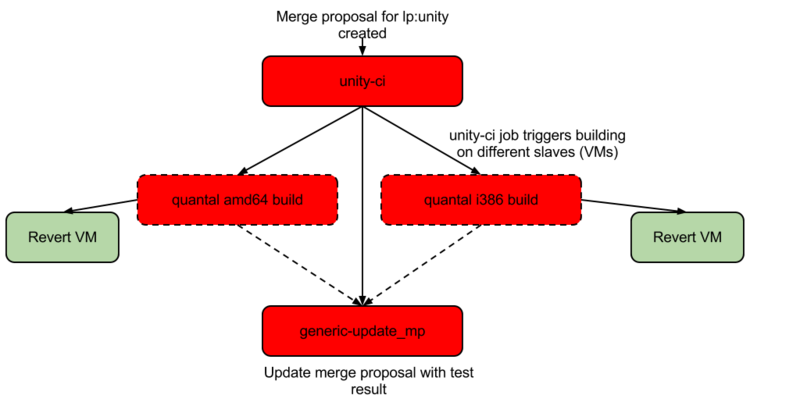 This will ensure Unity 2D remains reliable, consistent and fast. Thanks to Testability! Tests will improve your project’s quality too. Will you give it a try? This tutorial describes how to produce test-coverage metrics for C/C++ projects. We start by instrumenting an autotools build to produce gcov output with gcc; we then generate test coverage artifacts by running our test suite, and finally we explore our results using lcov. We’d like to assess the quality of the existing test suite for each Product Strategy project. A measurement of test coverage will tell us what part of the project’s code is “covered” or exercised by its tests. 50% is a start; 80% would be a good goal for a neglected project; one rarely encounters 100% test coverage, but we’d like to get as close as we can. Initially we’ll use these findings to gain an overview of the test-quality of each project; ultimately these metrics will guide the improvement of our codebase, and enable us to monitor our progress using Jenkins and associated open-source tools. Our first step will be to enable a special build. Ultimately this just means adding a few flags to our gcc invocation, but it never seems so straightforward with autotools projects 😉 . The Product Strategy Quality team has made available a set of files to facilitate this build–please check these out now if you’d like to follow along. Before we start let’s make sure we have lcov installed. lcov incoporates the GNU tool gcov and produces pretty HTML reports of our coverage results. (Note that the Debian lcov package includes genhtml.) We’re ready to begin. 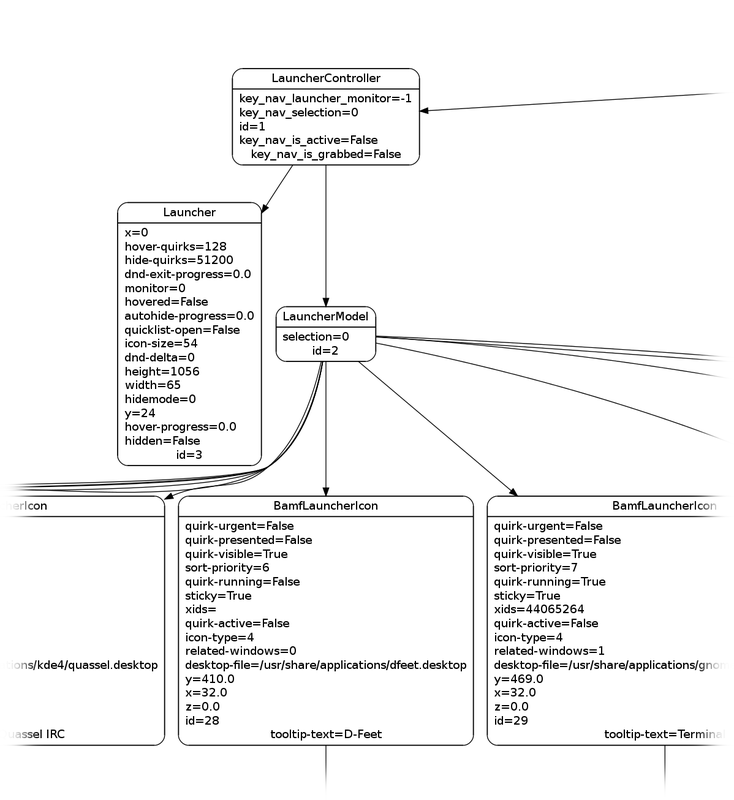 Open gcov.m4: here’s where we’re defining the compiler flags and checking for necessary tools. Let’s put this file where autoconf can find it. If you find such a directive, simply copy the gcov.m4 file into the named directory. If not, create an m4 directory and copy the gcov.m4 file there–and don’t forget to include a reference to the directory in the body of configure.ac (it’ll look like the grep result above). 3. Massage configure.ac to include our necessary coverage flags. When the tests are run, --fprofile-arcs produces a tally of the execution of each arc of the code–one .gcda file for each source file. The --ftest-coverage flag produces .gcno files, which link an arc to a source line so that we can see which lines were touched. We’ll watch these files being produced in a little bit; you can read about the flags at length in the GNU documentation. Note that we also remove optimization with the -O0 flag to get more precise results. Here we risk running afoul of the autotools “ancient ones”. This is an uncomplicated project–if you’re not getting the results you want in the next step, I can recommend The Goat Book as a decent tutorial on how these macros work. If all goes well we’ll find a .gcno for each .o file compiled. If not, then our flags aren’t being respected–maybe something’s wrong with our configure.ac addition in step 3. 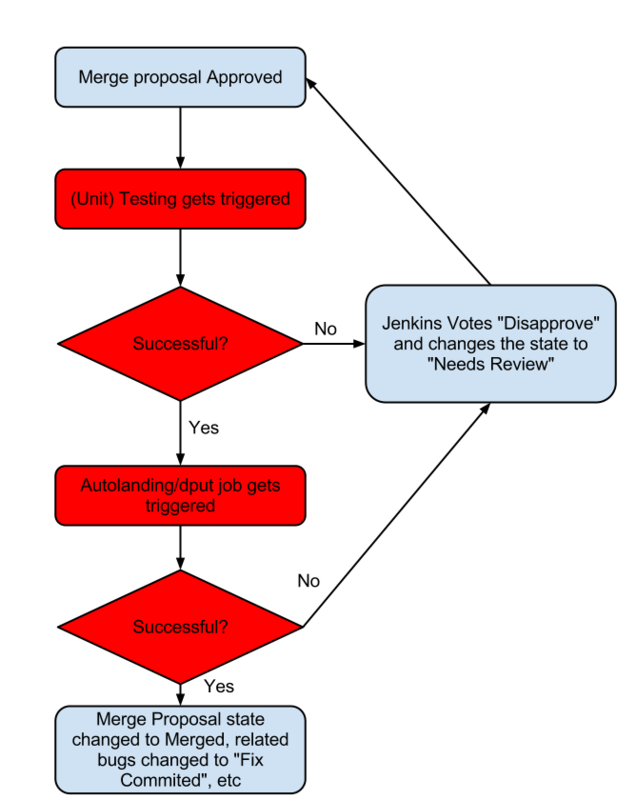 It’s important to have these checkpoints along the way to divide the autotools process into testable pieces. So now that we have the instrumentation we need, we’ll use a special build to run the tests. Copy Makefile.am.coverage into the top-level directory. Now we’ll actually run the tests. For a small project these figures show that we have a good test-suite to build on. We’re curious about what we’re missing, though, so we’ll investigate below. Before you register a comment about “no coverage results”, recognize that you may actually have zero code coverage. But at least you’re able to measure it, riiight? lcov has produced a coverage-results directory at the top-level of our project; open index.html with a web browser and explore. In our opinion the killer feature of the lcov output is the source-file display, which shows which lines weren’t touched by tests. Drill into the source directory to see the results for a particular file. Here in dbus-test-runner.c line 93 we’ve hit the line that tests the status of G_IO_STATUS_NORMAL 61 times, but never taken the path in the line below, for which G_IO_STATUS_NORMAL is false. We’ve presented an introduction to test coverage, featuring the gcc toolchain and autotools–as demonstrated with a set of utilities we’ve found useful here in the Quality group. I hope it’s obvious that this tutorial is just the beginning–not just of applying these methods to our code (we and you), but also of understanding what test coverage means to the improvement of Quality. Our team has witnessed that having an observable measure like the lcov green bars encourages developers to increase test coverage. However while chasing into a particularly narrow corner of their code, our developers have produced some confounding results which have caused us to doubt the accuracy of the available tools–I hope that Thomas Voss will follow with a post on some of his findings in the future. What lcov alternatives have you tried? Which hallowed autotools rituals have I profaned in preparing this tutorial? What’s the highest coverage percentage you’ve witnessed in a GPL project? Last week was my first one at Canonical and I spent it in Budapest where Ubuntu Engineering and Product Strategy teams had their rally. This is the first company where I was asked to travel on my first day and it did feel strange at the beginning 🙂 After being a Canonical employee for 1+ week I think it is the best way how to start in a new job. Quality really is a focus. Every single engineer I’ve met in Budapest was thinking in terms like unit tests or code coverage and how to make Ubuntu (even) better. More and more people inside Canonical are now focused solely on quality. We have several (great) Quality Engineers, a new QA Community Coordinator. I started last week and Canonical is still hiring some more. A lot is actually already done and you can see and touch the results. Just give 12.04 with the latest Unity 5.0 a try. Even more is on the way and we will try to cover most of that on this blog as times go. Being in Budapest was certainly overwhelming but it was worth it. I’m not a person who gets easily excited but now I really am (both from the people and the new products such as Ubuntu TV). I and other quality engineers plan to write more about tools, approaches or just things we consider useful, so please stay tuned. Do you have any good experience with specific methodology or tool? How did it help with your software projects? Is there anything specific you would like to see on this blog? With Canonical’s growing engagement with test driven development (TDD), we recently started introducing Google Test to a number of our upstream projects. Google Test is a unit testing framework targeted towards C & C++. It is lightweight and offers a load of features that ease unit testing tremendously. Most importantly, it supports automatic test case registration and the notions of test suite environments and fixtures. Here, a developer’s efficiency is our main focus. We acknowledge that providing a decent test coverage requires time and effort and we would like to free a developer from writing boiler plate code for test case setup, teardown and for acutally assembling his test cases. Recently, we started working on an extension to Google test that introduces a dummy (read:headless) X server environment by means of a custom Google test environment and custom Google test fixtures. In summary, the extension starts and stops a dummy xserver and makes sure that a connection to the server is established correctly as part of the test setup procedure. On tear down, the connection to the X server is terminated before the server instance is stopped. Jump over to launchpad for the actual project and take a look at utouch-frame for a real-world application of the extension. Continuous integration is a hot topic at Canonical and automatic execution of unit test suites is an integral part of our development model. For this reason, we store all unit test results in Google test’s XML dialect and export it to Jenkins to provide user, developers and QA with a summary of a project’s build status.